The star of Brasserie Bread is in their name. 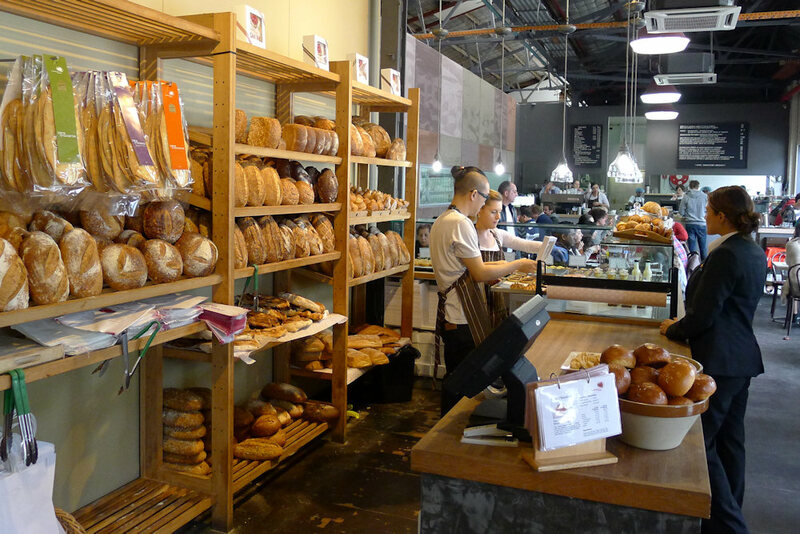 This bakery creates amazing breads and there are plenty of them to sample as you walk in. You may as well try some as you will be waiting in line for around ten minutes for a table anyway! Despite its spacious interior and plentiful seating, the line of people is incessant. The takeaway line was much shorter but with such fantastic looking plates being served, it’s hard to resist eating in. Awards adorn one of the walls: SMH favourite café 2007, Foodies’ Guide to Sydney 2007 best bread, Royal Easter Show 2006 best sourdough country loaf, RES 2007 bakers round champion, RES 2008 best pane croccante and best croissant to name a few. Available to buy are various jams, marmalades, oils, vinegars, muesli, flour and more. The fresh orange juice ($5) was sold out so we looked for an alternative. 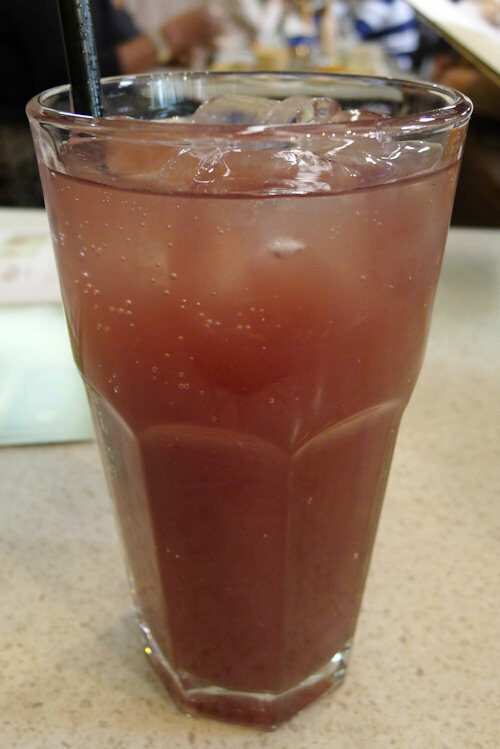 Several fruit sodas ($4) are available including mango, grapefruit, lime or apple. We sampled the pear & blueberry which, while containing no fresh fruit, was thirst quenching and refreshing. A large selection of Tea Craft teas ($4.50) are available as well as hot chocolate ($3.40 regular, $3.90 large) and dark chocolate ($3.90 regular, $4.40 large). The coffee was superb. 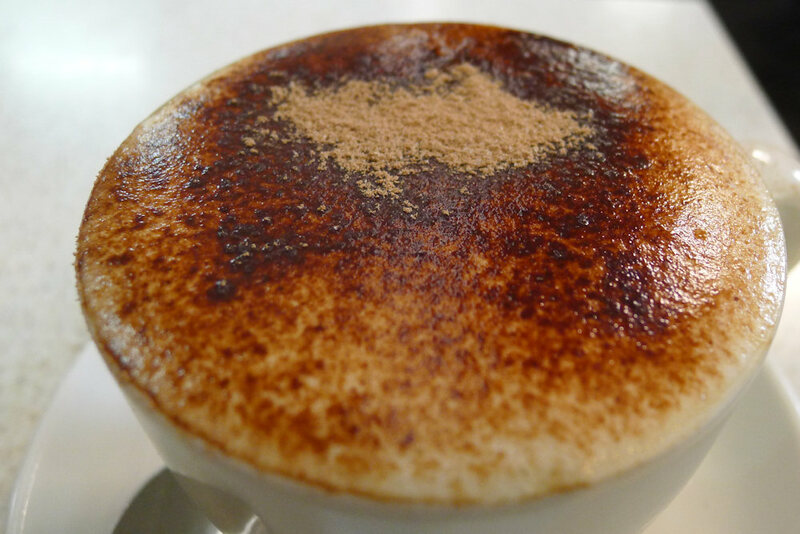 Our skim cappuccino ($3.40 or $3.90 large) hit the spot and could not be faulted! 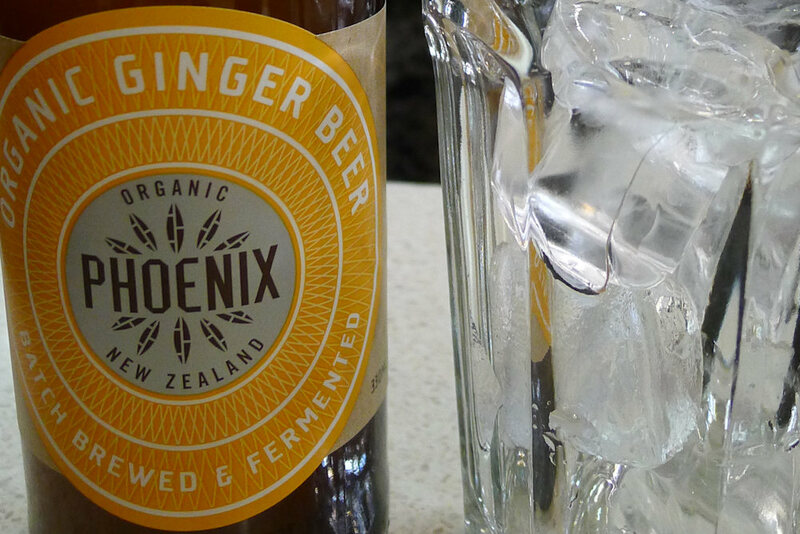 Phoenix organic ginger beer and cola ($4) is available and we found them to be a refreshing change from the staples. The breakfast basket ($7) offers a selection of toast and croissant served with three The Jammery jams (in our case fig and ginger, pear and strawberry and apricot). 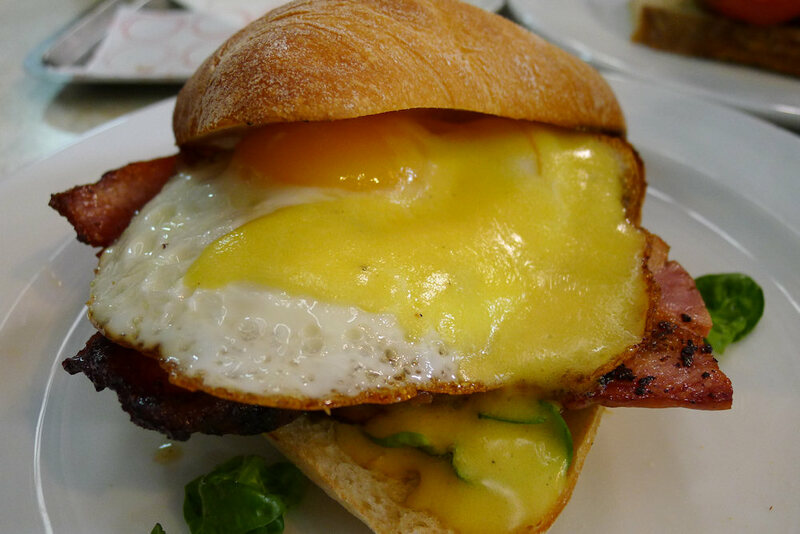 In case you hadn’t already realised, Brasserie Bread knows what they’re doing with breads. The toast and croissant were exquisite and each of the jams became a favourite of one of the people at our table. 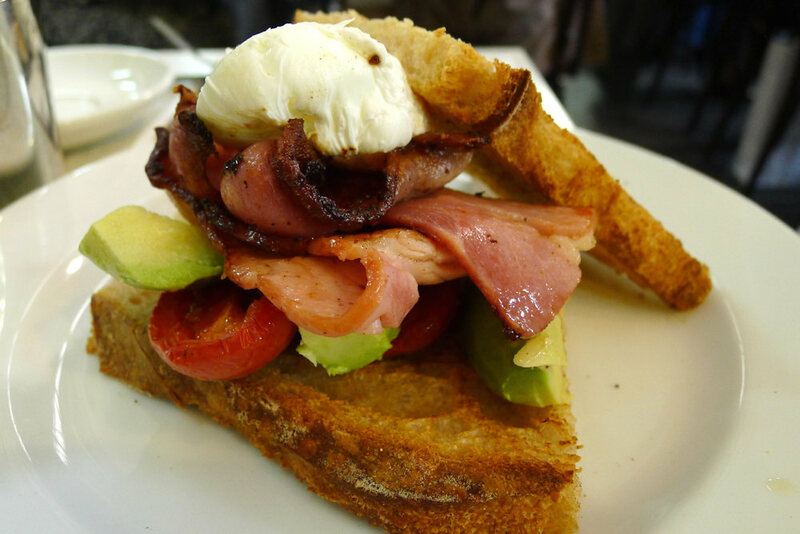 The crispy bacon and poached egg with avocado and tomato on wholemeal toast ($12) is a classic combination and was prepared well. Toast often takes a back seat to the other ingredients in dishes such as this but it actually added flavour as well as texture. There was also plenty of bacon and avocado for the price too. Dane chose the florentine panini ($11) only because the slow roasted pork shoulder and sweet potato hash with a fried egg ($16) was sold out. Close to a benedict in a sandwich, it came absolutely loaded with bacon. Spinach, egg and hollandaise complete the dish however the sauce lacked flavour. Despite this, the bread and other ingredients made for a great sandwich. 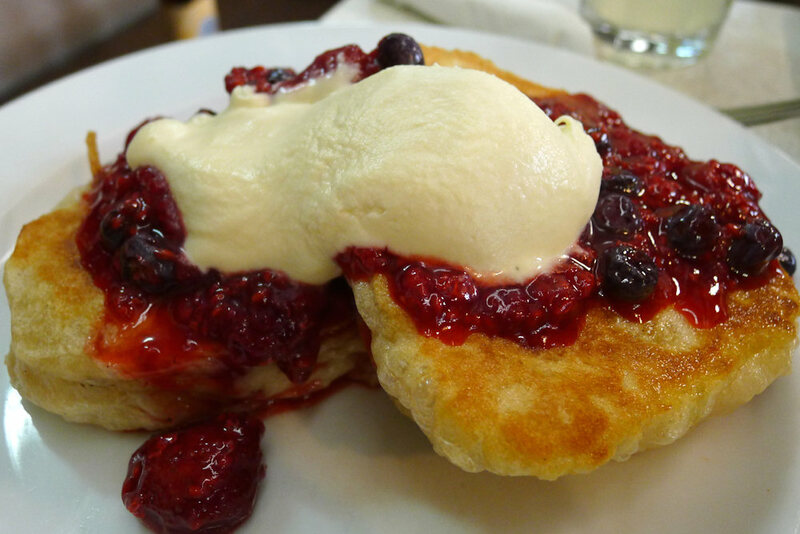 The sourdough pancakes ($14) are available with stewed berries and honeycomb cream or banana and maple syrup (and coconut as we noticed when they were served at the table next to us). Despite their thickness, the pancakes were very airy inside, bearing a resemblance to crumpets. They were soft and delicious, the berries plentiful and overall delicious. We knew we were in for something rich when we opted for the chocolate and caramel tart ($5) but we delved in nonetheless! 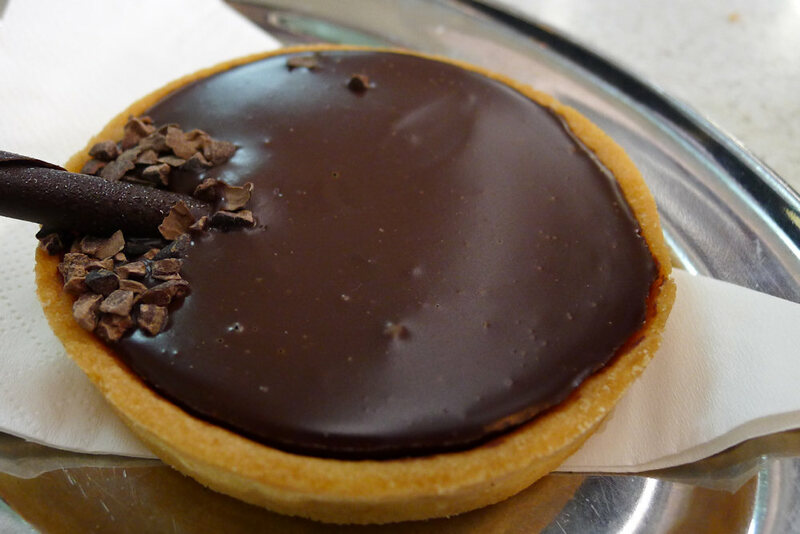 The thick yet soft chocolate made up most of the tart with a thin layer of caramel over the base. 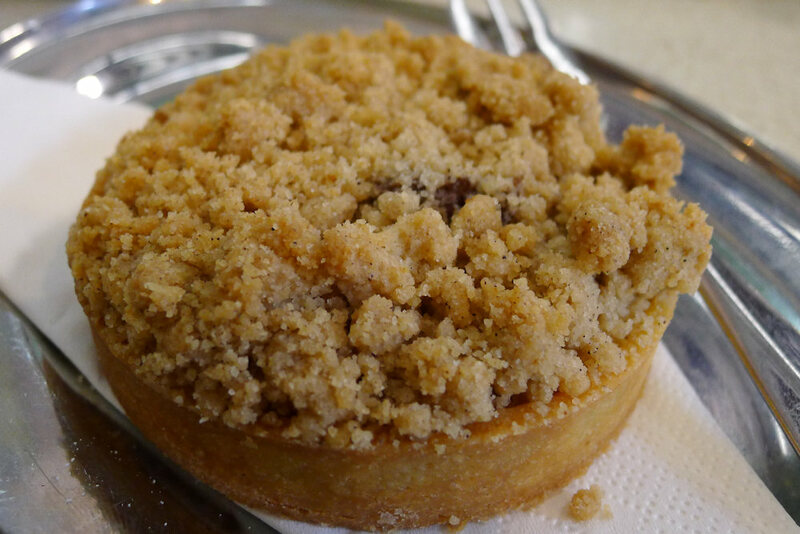 The pastry was crumbly and of very high quality. 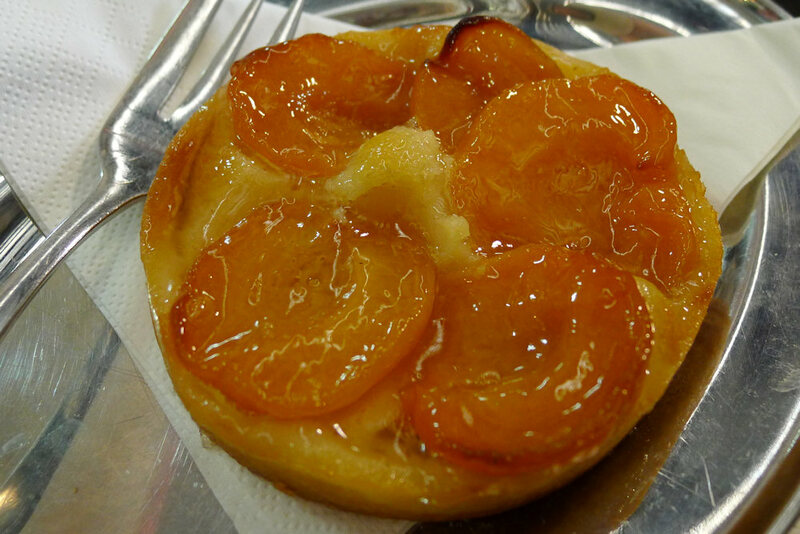 A refreshing break from the chocolate indulgence was the apricot tart ($5) which was loaded with apricots on top and a light custard inside. We were expecting moist pieces of apple inside the apple crumble however the crumble continued all the way through to the base making it quite dry. The cinnamon and spices did taste great however we recommend ordering a selection of the desserts available and sharing them. 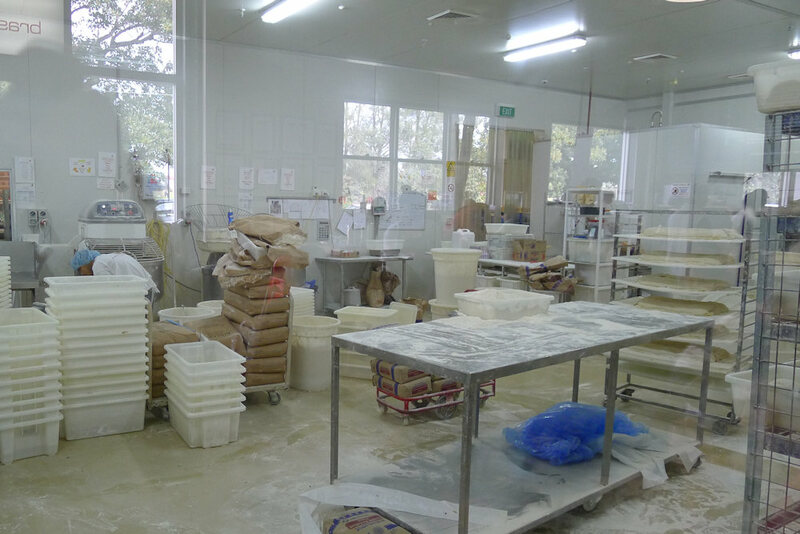 One side of the café contains glass windows looking into the bakery where you can watch the bakers working their magic. Bakery first, café second but as you have seen, that is not a bad thing. 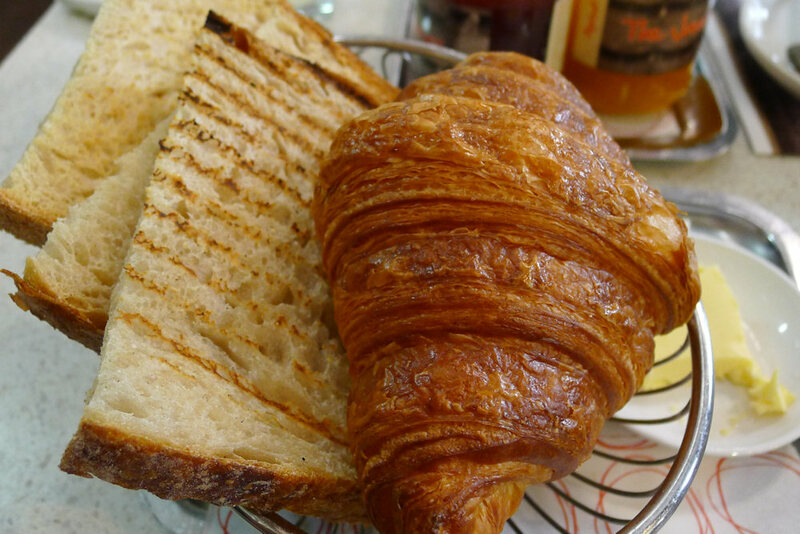 We thoroughly relished our meal and enjoyed the buzzing interior of Brasserie Bread. 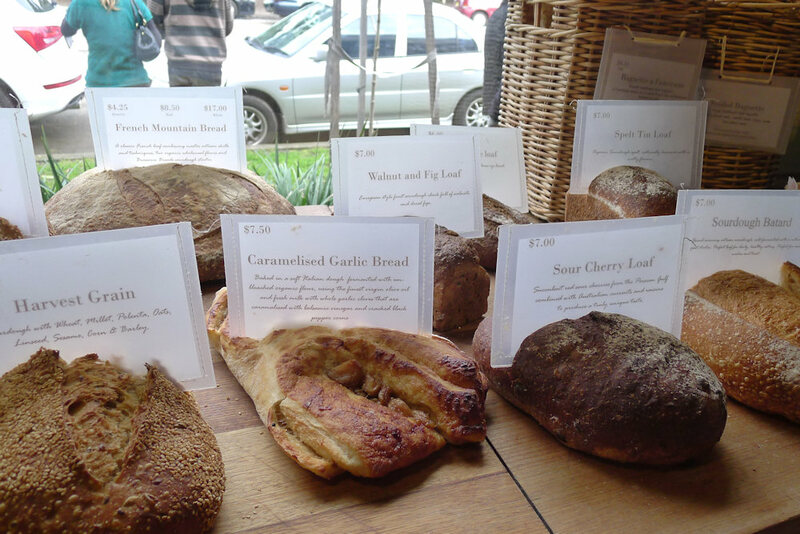 They offer bread schooling as well featuring everything from grain basics to baking with brioche. Classes are available for children and adults. You can also buy online from their website with delivery to various locations so you can choose your closest. 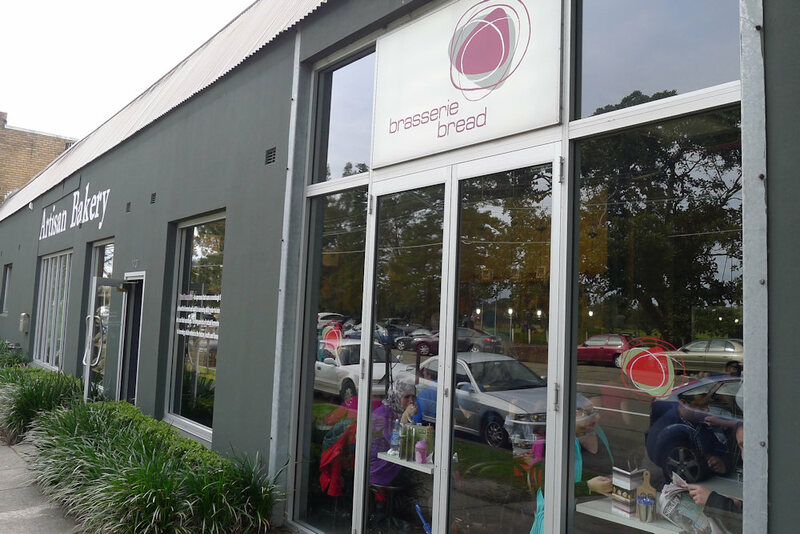 This entry was posted in Sydney - South and tagged Gluten free options, Organic Options, Parking close by, Reasonable prices. Bookmark the permalink.